We each have our own varieties of pain in life. Some pass. Some we live with forever. But the question — “WHY?” — is surely universal. Different religions, different cultures, offer different answers. Surely the question has been pondered throughout humanity’s existence on the planet. Of course, the question can be asked about circumstances that don’t involve pain or suffering. It can be asked and (maybe answered, at least in our own minds) about events that seem minor at the time, yet turn out to have long-ranging consequences. And … why did Italian tenor, Michéal Castaldo, with his uniquely glorious voice and style happen to hear the song … love it … and tell us con brio that he wanted to record it? Why did I become friends and musical partners with globally-known DJ, producer and remixer, Tony Moran? And why did I introduce Michéal and Tony to each other for a different project entirely? Could it be that my introduction led them discover that they wanted to collaborate on a Dance Club remix of “Everything Happens for a Reason”? 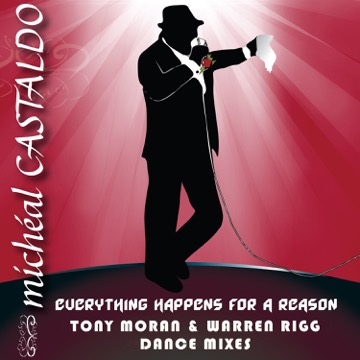 To quote from my own lyric, “IF everything happens for a reason” … then, perhaps a reason (“Una Ragione,” as Michéal expresses it in Italian) is the comfort and encouragement that the song has given to the many people with whom Michéal and others have shared it. I long ago lost count of how many people appreciatively thanked him for sending them the song as a birthday greeting, for example. People from all over the world have responded by telling him that the song and his performance have given them hope and a comforting perspective on their lives and worries. I’m proud of this song and of the talented team that has transformed it for the Dance Floor. I invite you to listen, own it and move along to the beat, as I do … even as you may choose to reflect on its message.